If you know me and some of you do, if you ever ask me what my favorite horror film is... my response is always "NIGHTBREED" from the book by Clive Barker called "CABAL". Now it's my great pleasure to see I am not alone, there are more of us who felt the stories needed to be told and that includes Joseph Nassise Author/Editor one of new authorized book by "TOR BOOKS". So step beyond the gates, find yourself below in the hidden caverns and share in the monsters' world behind Midian. Thank you to Joseph for his time and Desirae for making it all happen... enjoy! 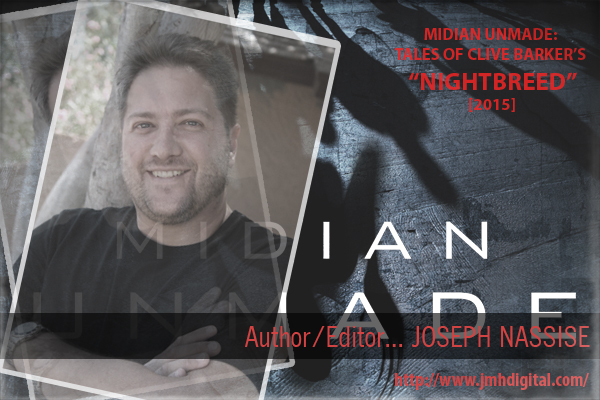 Jeremy [The Wolf]: Being a continuation of the original "Nightbreed" tale, what do you think fans should take away after reading this book "Midian Unmade"? Joseph Nassise: Cabal (the original Nightbreed tale) played with our perceptions of what is truly monstrous, making the monsters more humane than the humans and the humans more monstrous than the monsters. 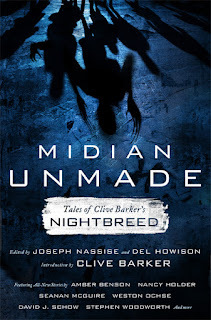 The writers of the stories that make up Midian Unmade strove to mirror that approach, to play with the way we look at beauty and horror in equal measures. Jeremy [The Wolf]: Which of the characters within the book "Midian Unmade" do you feel had the strongest story to tell and why? Joseph Nassise: To be honest, I don’t think any one story is more relevant or stronger than any of the others. My co-editor, Del Howison, and I, tried to select stories that remained true to Clive’s original vision for the Nightbreed, focusing in on the theme noted above, and so no one particular character exemplifies that more than any of the others. I have my favorite stories, as I suspect anyone who reads the anthology will, but that doesn’t make a particular tale stronger or more important than any of the others. Jeremy [The Wolf]: With the recent release of the long awaited "Nightbreed: Director's Cut" on BLU-RAY/DVD, was this book in development before or after this release? Joseph Nassise: The concept for Midian Unmade: Tales of Clive Barker’s Nightbreed was first conceived nearly four years ago, in late 2011, so it was definitely in development long before the release of the Director’s Cut. Jeremy [The Wolf]: I had always felt the film was a middle that needed a beginning and an end, do the writers give us that... or is there more we can take away for future tales? Joseph Nassise: I always felt that the film itself was Boone’s tale. Given that, I don’t think Midian Unmade could be considered a beginning or an end for Nightbreed. It’s more like a branching of the tree than anything else; the major plot-line has suddenly expanded and given readers the opportunity to follow all these additional stories that split off from the primary one. And I’d definitely consider doing another volume or two if the public response to this one is as good as I hope! Jeremy [The Wolf]: Before being involved with this project, what were some of your favorite horror characters, stories or films? Joseph Nassise: Clearly Cabal is one of them. :) I’m a fan of Clive’s work in general with Damnation Game, Weaveworld, The Great and Secret Show, Everville, and Coldheart Canyon being particular favorites. Dan Simmons, Robert McCammon, John Connolly, and Charlie Huston are also other personal favorites. About Joseph Nassise: is the author of the Templar Chronicles and the Jeremiah Hunt novels. He has been a finalist for the Bram Stoker Award and the International Horror Guild Award. He lives in Arizona with his family. Kronos Records: NOW IN STOCK! La-La Land Records: JAMES HORNER RELEASES! KILL ME THREE TIMES [BLU-RAY/DVD] - SIMON PEGG!